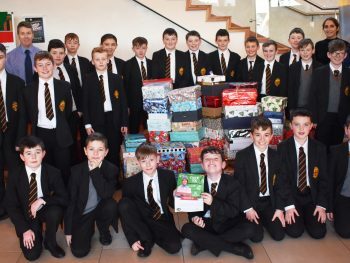 Year 8 pupils from Abbey Grammar School present Mrs Denise Nixon a representative from the Good Samaritan Christmas Shoebox appeal, with many shoebox gifts which Year 8 pupils have been putting together over the past number of weeks. Accompanying them are Mr Sloan (Principal), Mrs mc Keever (RS HOD) and Mr Mc Mahon (RE teacher). A huge congratulation to all Year 8 pupils who took part.